Granite has been around for thousands of years in all types of building applications, in fact there are granite applications that date as far back as Ancient Egypt. Due to the fact that it was difficult to acquire it used to be available only to the powerful and wealthy. Fortunately, with new technology and improved quarrying techniques it has become easier to obtain and one of the most popular choices for today’s countertops. It’s durable, affordable, and beautiful. There is no comparison to the natural beauty of granite. Like a snowflake, every piece is different; even if it is cut from the same block there will still be slight differences from slab to slab, ensuring that your countertop will be a natural, beautiful, original work of art. We have many colors that will match your decor beautifully. 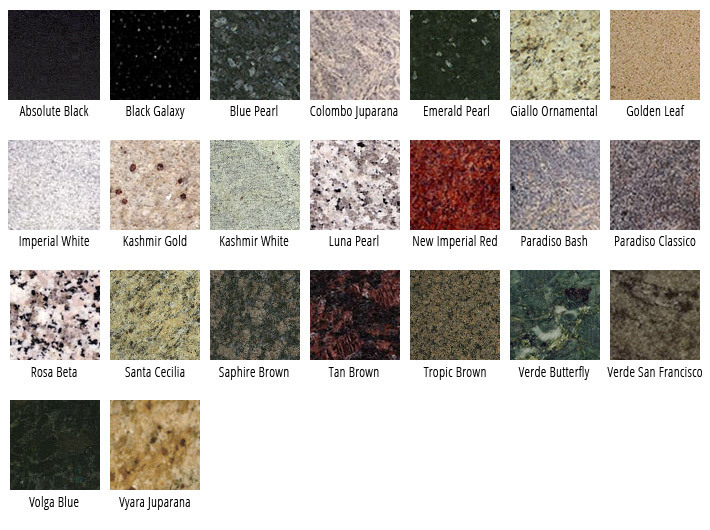 These are just a few of the many granite colors we have available. Please contact us at 716-892-5294 so we can provide you with a current list of our colors. Jacqueline, you were a wonderful help and it was a pleasure to do business with you.